Foothill Music Theatre is staging the timeless and timely “The Sound of Music” and doing a fine job. Based on the von Trapp family singers, who made their way to the United States from Austria in 1938, the book by Howard Lindsay and Russel Crouse tells a story of love, the pursuit of one’s dreams and the refusal to compromise one’s principles. To most people, however, it’s a captivating show filled with memorable characters and even more memorable music, thanks to composer Richard Rodgers and lyricist Oscar Hammerstein II. The central character is Maria Rainer (Jillian Bader), a would-be nun who loves to sing. Despite her eagerness for the religious life, the Mother Abbess (Rachel Michelberg) sends Maria to the home of retired navy Captain Georg von Trapp (Scott Solomon), a widower whose seven children need a governess. She finds a household with lots of military precision and little fun. She soon changes all that, mainly through music and the belief that children should be children, not martinets. Before long, she also softens Georg’s heart and helps him to see how much the children need a loving father. They’re eventually married, much to the children’s delight. Their happiness is short-lived because fascist Germany is a growing threat. When local Nazis ask Georg to take command of a German ship, he has little choice even though he despises fascism. 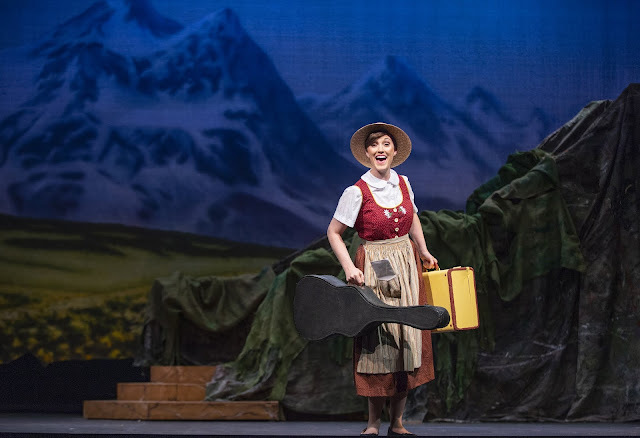 However, a singing contest managed by his friend Max Detweiler (Aaron Hurley) offers a chance for the family to escape across the Alps to Switzerland. The show is ably directed by Milissa Carey, who does especially well with the youngsters, who are double cast except for Madison Colgate as 16-year-old Liesl, the oldest. Choreography is by Brett and C.J. Blankenship. Music director William Liberatore leads the excellent orchestra and some outstanding choral singing by the nuns and the von Trapp children. As Maria, Bader combines charm and a likable stage presence with fine singing. Claire Lawrence as Elsa Schraeder, Georg’s former fiancée. Production values are high with a set by Kuo-Hao Lo, lighting by Michael Ramsaur, sound by Andrew Heller and costumes by Mae Matos and Lisa Rozman. Extra kudos go to the entire cast for maintaining composure at the first Sunday matinee, when the audience was filled with children, some very young. Hence there were distractions like crying, leaving for the bathroom, talking and fidgeting. Although seeing a great show like this could benefit children, parents should make sure they know how to behave. Music” will continue through Aug. 5 in Foothill College’s Smithwick Theatre, Interstate 280 and El Monte Road Los Altos Hills. For tickets and information, including parking restrictions, call (650) 949-7360 or visit www.foothill.edu/theatre.